Yet another month passed, yet another segment finished. Or shall we shall, a new month came, a new segment started! One more chance to live the life with more knowledge and humanity! 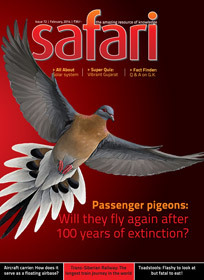 The new issue of Safari magazine also hit the stands and we are ready to explore the stuff. Ready to dig deep into the content of the same. Fasten your seat belts! Here we go!!! A cover page with planets makes the first impression of the magazine, and the inside first cover page have the fascinating picture of Crumbling Colosseum. Mobile phones are like the essential part of the life for the majority of people now. The portability and communicate from anywhere makes it a boon. And now added the versatility! You can do banking, send emails, attend conferences, read books and much much more with the hybrid devices which are most computer and less and ordinary phone. The more useful it is, more we are dependent or say reliable on the same. It makes it even more important to take care of the device. In case of loosing the instrument, we loose a lot. One well known fact is each mobile instrument have its own unique identification number known as IMEI number, which is usually found by dialing *#06# from any handset. When you purchase a mobile, it is available in the bill also. In case of iPhone and other costly instrument, you find the number on the back flip of the case also. Anyway, it is important to keep it with you as in case the mobile is stolen or lost, it can be tracked from that unique number which is shared by not any other mobile in the world. Apart from this number, what are the other stuff you need to know about it? Well a small, one page article “How to cope up with a lost or a stolen mobile number” might help you! We took note of Aakash – the cheapest tablet of the world which when available, and if live up to the expectations and claims, will surely change the world of study. A lot of feel good and technical stuff is mentioned in the article, which let the read know the tablet properly. Though, when it will be available to the mass is still a mystery! If that also have had covered in the article, the article will be even more informative. Ravindra Aacharya’s article about Samoa Island brings us some factual information about the same. It also refer the famous novel by Jules Verne “Around the world in eighty days”, to start the article, very intelligently. The day of 30 December 2011 had not seen by the Island. So the island has a missing day in its memory! How was that possible? Well, better you read the article and know more facts! Not everything only bad happens! Some good news are also there in terms of Wild Life. Kakapo parrot from New Zealand was almost lost. It is the heaviest parrot in the world for the matter of fact. What make its existence to risk and now it is back from dead is the theme of the article by Samarth Vyas. Well, the one who joins the army know that there is no easy life is waiting for him. The soldiers do not expect the bed of flower on the border of course. That is why they need to train hard and harder so they need to spend less blood at the battle. Still the life of a soldier commissioned at Leh and Ladakh are even harder. The biggest enemy there is the climate. Have you ever wondered that at the highest army points of the world how they were living? How do they receive their needful? In addition to arms and ammunition they need food, their letter from loved ones, and a lot more! Living there is difficult and so does the transportation. Gajaraj helps the corps there! It is the giant transport aircraft (originally named as Ilyushin-76) of Indian Air Force. All its flights are a challenge in itself. It carries the heaviest tanks, missiles and anything needed there! A very detailed and informative article about the same is a must read. Interestingly, sometimes the cargo needs to dispatch down using parachutes! Actually there are several places marked on the sloppy snowy hills where the container should be dropped. So it must be absolutely fine calculation about the release point and angle, to be done and it should be released at the right time. The stuff reaches to the soldiers intact though! Bravo!!! Know more interesting facts about the Army, the Airforce, the Gajaraj and it’s role. Our solar system holds a lot of mysteries within the same, and some of them are about itself! Top-five climatic extremes in our solar system is the article where you can know a lot of facts about our solar system. For example Which celestial body in the solar system is the hottest and which is the coolest? There are more amazing questions and its even more amazing answers too! The main sections are Maximum heat, Maximum cold, Most violent storm, Most terrible sandstorm, The wettest place. Now a days the steam engines are considered as retired technology. India is seeing ‘The End’ of the steam era of Indian railways. A two page article in the central most pages of the magazine briefs a few interesting details about various stages of progress for the Railway engines. Which includes the information about the golden age of steam locomotive to the end of the golden age after 143 years to cover most. Some important titbits about India’s steam locomotives, is also worth reading. Being mammals dolphins have to surface in order to breathe fresh air. They cannot go into a full deep sleep, so they let one half of their brain sleep at a time! Tiger moth jams the natural sonar of its predator – the bat – by emitting ultrasonic sound! There are more to-the-point article about some strange facts about various species. The article about zoology is not less interesting or dry read at all. Shushil Bhatia brought us some interesting facts more interestingly. Other important points explored are “the relationship between silver ants and acanthodactylus lizard”, details of “rhythmic On and Offs of light emitted by group of the male firefly” and much more. Go for it and read it, you will love it. From where does the sweet water come inside coconut? What is its role in the coconut? What is the difference between an ordinary CD and DVD? What is a jet fighter such as MIG-21’s cannon like, which is used by its pilot against the enemy aircraft in the aerial dogfight? Why does a slice of bread with liberal application of honey on one side bend like a concave lens. Which are the top ten countries in the crucial matter of petroleum reserves? Is it true that Mount Mauna Kea of the U.S.A.’s Hawaii island is higher than the Mount Everest? Why does ayurveda proscribe eating some items simultaneously on the grounds that together they are harmful for health? How does the Indian Army’s amphibious tank PT-76 manage to sail and manoeuvre on water surface? What are the salient aspects of its design? Why pulses and beans contain protein? Why protein is absent from vegetables? The super Quiz section explores the facts about Famous statues of the world. All study and no fun makes one a dull fellow, Gags section is the answer to the proverb. Last but not the least important is “All about airport operation and economics. Surely there are the things which were unknown to you will come to the knowledge. Final verdict: Of course go for it. There are quite a few magazines which concentrates on the knowledge, facts and intelligence rather than gossips and skin show. Safari is one of them. You will get better value for money here.